Where’s The Apology from the Democrat Party? It is not at all surprising that this piece of journalistic malpractice doesn’t have a name associated with its authorship. No one in their right mind should want to take responsibility for writing such an uninformed and biased hit piece like this article. The focus of this article should have been the FACT that Dr. Abdulrahman Mohamed El-Sayed was “out of line” when he said on live television on May 10, 2018, at the Michigan Press Form debate that, “Muslim Definitely Hate You” to the finest, bravest, highly intelligent and most principled candidate Michigan has had running for the Governor’s office in a long time – Mr. Patrick J. Colbeck. The Democrat Party and Dr. El-Sayed himself owe Mr. Patrick J. Colbeck the apology, if an apology is in order; not the other way around. I would suggest that the tactic that is despicable is the tactic of name calling in response to legitimate concerns about America’s national security. Gubernatorial candidate Patrick J. Colbeck most definitely did not “muslim bash” when he voiced concern about another person running for Governor who potentially has ties to the Muslim Brotherhood (MB), an organization that is designated as a terrorist organization in countries around the world. And you say that there is “absolutely no evidence to suggest that El-Sayed is anything but a loyal American citizen of the Islamic faith” is about as reliably subjective a statement as a statement that might say “there is absolutely no evidence that the tooth fairy doesn’t exist.” Your statement is what has “no evidence,” as does the aforementioned other example of a purely subjective opinion. In November of 2017, Dr El-Sayed called for Michigan to become a sanctuary state – which to me tells me that he is against our constitutional rule of law. How can we possible trust a man to properly lead our state when he proclaims that we should defy our own laws? How can we possible trust a man to properly lead our state who makes an offensive comment like, “Muslims definitely hate you” on live television. And how can we trust a media who attacks the victim rather than the perpetrator? How naïve do you think the citizens of Michigan are? Or is the better question, “how naïve do you want the citizens of Michigan to be?” Mr. Patrick J. Colbeck’s concern about civilization jihad has nothing to do with El-Sayed’s “name or religion.” Even possibly insinuating that Mr. Patrick J. Colbeck would have a “concern” about a person’s name is yet another instance where your article’s author uses dirty ad hominem attacks that are designed to incite anger, rather than to address facts. And the fact that you are calling Islam “a religion” is further proof that it is the Detroit News editorial staff that either has its collective heads in the sand and are totally uninformed about the historically more accurate definition of Islam as a militaristic political theology, or you are subversive in your own right, and are as potentially dangerous to America’s national security as the MB potentially is. For the Detroit News to say that Senator Patrick Colbeck should apologize to Dr. El-Sayed is so irresponsible as to be almost laughable, if it weren’t so blatantly biased, racist and bigoted (to use a couple of buzzwords that the anti-America crowd loves to throw around like candy at a parade). Could it possibly be that the Detroit News editorial staff itself is appealing to the worst elements of subversion against the United States of America? I wonder. 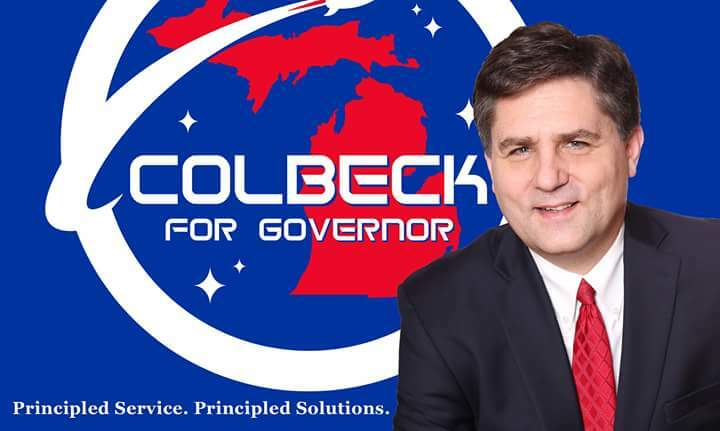 It is incumbent upon The Detroit News to prove me wrong by getting answers to Senator Colbeck’s legitimate national security concerns regarding the Muslim Brotherhood. I won’t hold my breath. Turmoil in the Washington Cesspool!Does it Get Any Worse than This?